SPLENDID LARGE ROBERT LONGO LITHOGRAPH! THIS LITHOGRAPH IS ABSOLUTE MINT PERFECT CONDITION! 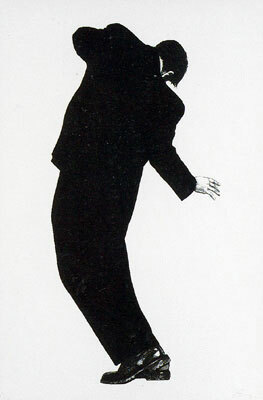 ROBERT LONGO RAPHAEL, 1998 LITHOGRAPH on BFK Rives. Signed and numbered in pencil. Features amazing exciting tones on this print, excellent! This elegant striking piece would make a splendid impression and fantastic statement anywhere. Features incomparable colorations and beautiful lines on this print. Made of the very Finest Archival Museum quality Paper and in excellent NEW MINT CONDITION. This item selling in Upscale Art Galleries and Museum galleries when it can be found. This is a large Print reproduction, perfect for any elegant home, office, restaurant or place of business " THIS ITEM IS SUBJECT TO AVAILABILITY!" . Robert Longo was born in New York City in the borough of Brooklyn in 1953 and raised in Long Island a suburb of New York. Longo became interested and intrigued with all manner of mass media including television, popular movies, comics and magazines which continues to influence his work today. This fascination is evident in much of his work including his most recognized  Men in Cities series. These taunt stylized figures are captured and frozen in mid motion. Click the button below to add the Signed Raphael by Robert Longo to your wish list.